Grilled summer vegetables, marinated with Grill Mates® Zesty Herb Marinade, is a perfect accompaniment to any grilled meat or seafood. 1. Mix Marinade Mix, water, oil, vinegar, sugar and liquid smoke in small bowl. Place vegetables in large resealable plastic bag or glass dish. Add marinade; turn to coat well. 2. Refrigerate 15 minutes or longer for extra flavor. Remove vegetables from marinade, reserving marinade. 3. 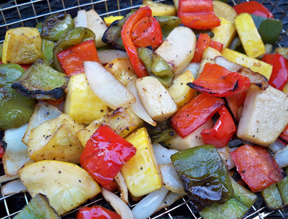 Grill vegetables over medium-high heat 2 to 4 minutes per side or until tender-crisp, brushing with reserved marinade halfway through cooking. (Grill tomatoes about 2 to 3 minutes per side.) If desired, drizzle vegetables with remaining marinade. Grilled Vegetable Sandwich: Serve grilled vegetables on grilled Italian or rustic bread. Top with sliced fresh mozzarella cheese, baby greens and sliced red onion.